IBM DB2 Replication (called DataPropagator on some platforms) is a powerful, flexible facility for copying DB2 and/or Informix data from one place to another. The IBM replication solution includes transformation, joining, and the filtering of data. You can move data between different platforms. You can distribute data to many different places or consolidate data in one place from many different places. You can exchange data between systems. 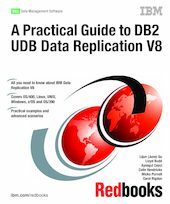 The objective of this IBM Redbooks publication is to provide you with detailed information that you can use to install, configure, and implement replication among the IBM database family - DB2 and Informix. The Appendix C provides information about configuring federated access to Informix, which can be used as a model for federated access to other non-DB2 database, such as Oracle, MS SQL Server, Sybase, and more, using DB2 Information Integrator V8. The book is organized so that each chapter builds upon information from the previous chapter.